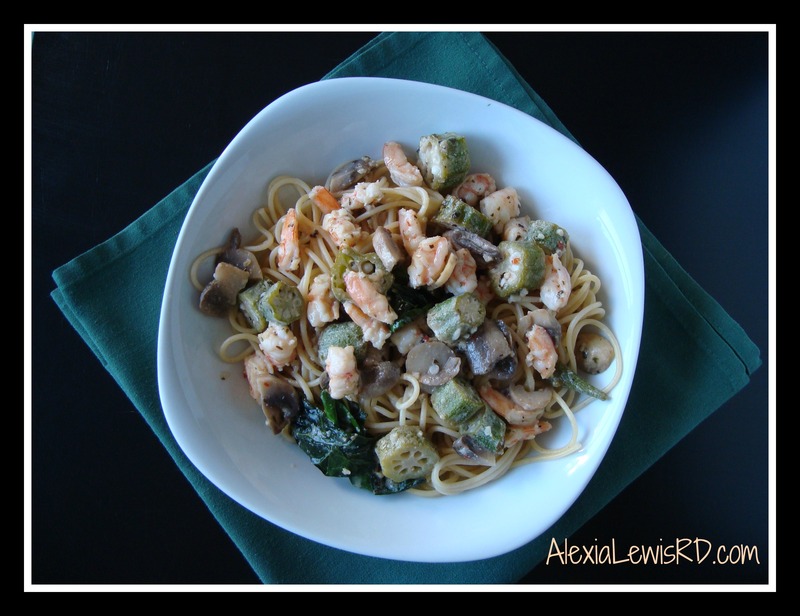 Southern Shrimp Scampi | Alexia Lewis R.D. Yes, shrimp scampi can be heart healthy! With a few adjustments, this dish becomes low in saturated fat, cholesterol, and sodium and yet is still chock full of flavor. I believe a traditional scampi would include lemon and butter; but I used what I had on hand from the wonderful UNF Ogier Gardens. I ended up with a scampi that has okra and kale. Since these are traditional southern ingredients, I named this southern scampi. This recipe is one the came together as I cooked it and so the ingredients are estimations. I did not measure ahead of time and I ended up with 3 servings (an odd number for a recipe, I know!) and leftover spaghetti. If you want more or less of an ingredient or don’t think the consistency is right (too watery or too dry), please make adjustments to the amounts listed. Begin spaghetti by boiling water. Add spaghetti and cook to desired tenderness. Drain and set aside until sauce is prepared. While pasta water is coming to a boil, begin sauce by heating oil in saucepan. When heated, add garlic and sauté 1 minute – do not let it brown. Add okra and cook, stirring frequently for about 2 minutes. Add half of vegetable broth and white wine and simmer, stirring frequently until okra begins to soften, about 5 minutes. Add kale and mushrooms and cook until kale begins to wilt. Add shrimp and the remaining vegetable broth and white wine. Simmer and stir frequently until shrimp is pink and cooked through. Sprinkle liberally with garlic powder, Italian seasoning and stir to combine. To serve: top 3/4 cup of spaghetti with 1/3 of southern shrimp scampi sauce, sprinkle with a small amount of pecorino-romano cheese. Serve hot. Let me know what you think. I’d love to hear about any adjustments you make! It was divine!! Have you given it a try? (Sorry for the late reply – I just found your comment).